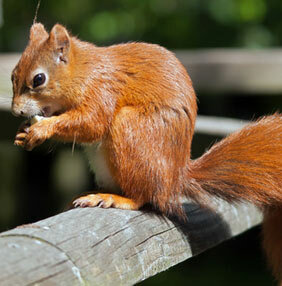 Red Squirrels are rust-red fur on the top and white-gray fur on the bottom. Its 10 ½ to 15 ¼” long and weights between 5 to 9 oz’s. It mates in the spring and a litter of 3-7 young are born around March-April. The red squirrel is very territorial and will chase away other squirrels twice its size.